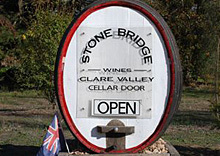 The Clare Valley and Stone Bridge Wines are an easy one and a half hour drive from Adelaide making the region and easy day trip or holiday destination. 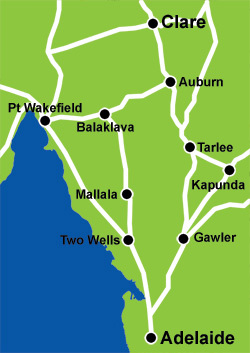 From Adelaide you can either head north via Main North Road towards Gawler. Stay on the Gawler bypass (do not go into Gawler) then follow the signs to Roseworthy, Tarlee, Auburn, Watervale, Sevenhill. 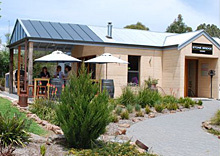 Just before the Clare Caravan Park turn left onto Spring Gully Road, then left onto Gillentown Road and look out for our driveway on the right. For a slightly quicker option head north via Main North Road through Gepps Cross and onto Port Wakefield Road. Stay on this Road until you see signs to Two Wells. After the Two Wells exit sign, turn right to Mallalla, then Balaklava. There's a heavy vehicle bypass road that saves you going into Balaklava. From Balaklava travel straight through to Halbury then turn left when you get to Auburn. 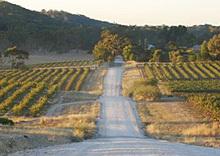 Then travel through Watervale and Sevenhill towards Clare.